Today our expert guest is Dr. Nicholas Opie. 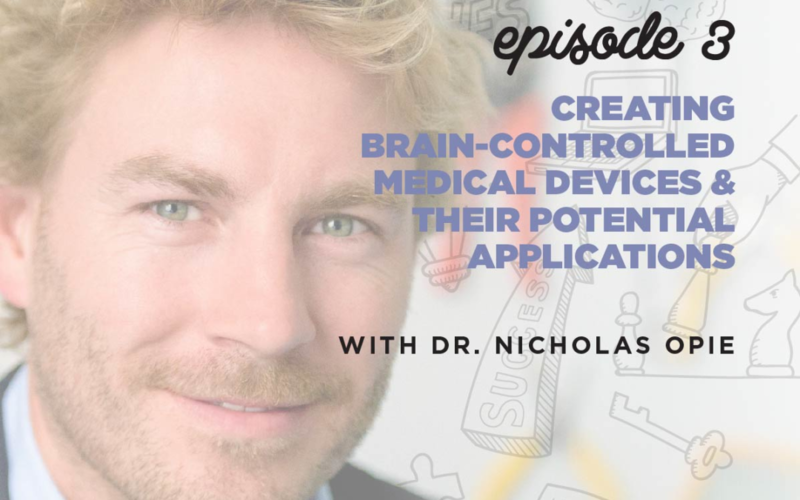 He is a biomedical engineer with experience in neural prosthesis, co-head of the Vascular Bionics Laboratory, and Founder of pioneering endovascular bionics company Synchron, Inc.
Vascular bionics combine biology and medical electronics in the bloodstream. Devices like stents and pacemakers are currently using blood vessels, and Dr. Opie sees these as an opportunity to access the brain without open brain surgery. These bionics have potential applications for individuals who suffer from paralysis, traumatic brain injuries, and degenerative diseases. Too often, engineers and researchers create something fantastic that never reaches clinical use. Synchron is devoted to making these technological breakthroughs medically applicable. They’re currently developing STENTRODE™, the world’s first endovascular electrode array. It is a minimally invasive implantable device designed to interpret signals from the brain, and Synchron is currently preparing for a pilot clinical trial of the device. They plan to evaluate the safety and feasibility of the device to enable patient-directed brain control over mobility assist devices. He’s confident people will be able to control wheel chairs and computers using the device, and his ambitious goal is that the technology will also allow people to control prosthetic limbs. If you enjoy what you do, then it’s not working. Learn More: Vascular Bionics Laboratory | Synchron, Inc.